This Bacon-Cheddar Potato Salad recipe features three things that go together deliciously — potatoes, cheese, and bacon! This potato salad is a favorite in our house and served at many of our barbecues and summer parties. With Father’s Day just around the corner, and it seemed only fitting that I share one of my Dad’s favorite things: my Bacon-Cheddar Potato Salad recipe. 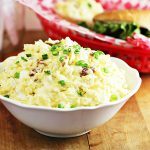 This potato salad originated years ago with my husband’s sister who started making potato salad with bacon and cheese. I took it from there and ever since, I’ve been making my version of it for my family. My dad absolutely LOVED my potato salad. He always requested it and it always made him happy when I made it for our barbecues and get-togethers. In 2008, my brother flew from California to my Dad’s house in Virginia, so my family and I drove 6 hours from our house to spend the day with them. I cooked the potatoes and the eggs before our road trip and when I arrived at my Dad’s house, I cooked up the bacon and finished making it. My Dad barbecued up some “chicky” as he called it. While this usually meant drumsticks or thighs because of how cheap they can be, this barbecue was special and he made chicken breasts. At dinner, my Dad raved about my potato salad, like he always did. And, like always, he ate a helping that would be easily made for 2-3 (or more) people. We still have no clue to this day where he packed away all the food he ate. It was a wonderful barbecue. We reminisced, we laughed, we took photos…and we loved being with each other. I didn’t know that this would be the last time my Dad would enjoy my potato salad. I didn’t know it would be the last time I would spend time with him. I didn’t know that the next time I would be at his house, he would be gone. I’ve had several Father’s Day’s without him here and it’s still hard. Father’s Day was very important to him. He didn’t care about getting presents, but loved getting a call from each of us kids. I wish I could call him up today and hear him say one more time “I love you too sweetie”. His kids were truly his world and if anything comforts me this Father’s Day, it’s knowing that. 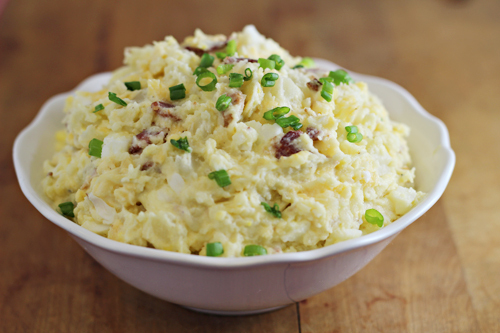 In honor of my Dad on Father’s Day, I am happy to share my Bacon-Cheddar Potato Salad recipe with you all. The first step in this recipe is washing and boiling the potatoes. I use russet potatoes usually, but have also used Yukon Gold or other varieties on occasion. I boil them with the skin on and when they are done, I drain them and allow them to cool completely. When they are cooled, I peel the skins off (using my fingers, but you could use a peeler if you prefer). Finally, the potatoes are cut into cubes. While my potatoes are cooking, I cook the bacon, shred the cheese and hard-boil the eggs. Everything is combined together, including mayonnaise and salt and pepper to taste. Scrub potatoes well and place in a large pot. Cover with water and bring to a boil on the stove. Reduce to heat to a medium and continue to cook for approximately 15-20 minutes or until potatoes are tender. 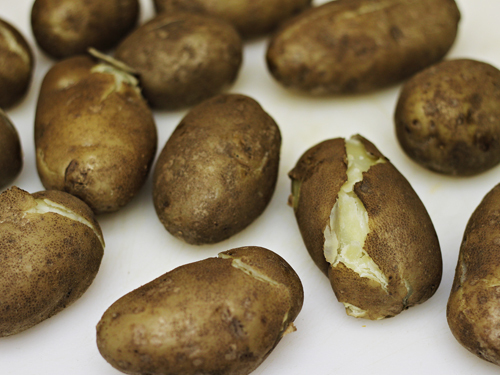 Drain potatoes immediately and remove from pot. Allow the potatoes to cool completely. While potatoes are cooling, peel the hard boiled eggs and allow them to cool (if not cooled yet). When the eggs are cooled, chop them. Cook bacon according to package directions and when cooled, chop or crumbled the bacon. When potatoes are cool, gently peel potato skins from the potatoes with your fingers (or gently with potato peeler if you prefer). Dice potatoes so they are in chunks and pieces are somewhat uniform in size. 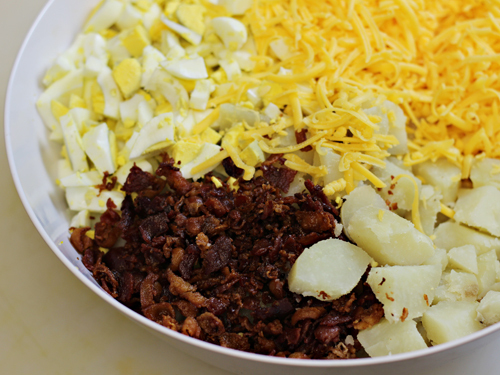 Place potatoes in a large mixing bowl, add cooled bacon, eggs, and cheese. Combine gently. Add mayonnaise to potato mixture and combine. Season, as desired, with salt and pepper. Garnish with sliced green onions or additional crumbled bacon, if you wish. –For a bit of zippy flavor, sometimes I like to slowly drizzle and mix 1/2 cup apple cider vinegar into the potatoes/bacon/cheese mixture before adding the mayonnaise. This can also help to use less mayonnaise, if you wish to reduce calories/fat content. –This is a versatile recipe: if you wish to use more of the ingredients listed, go for it! Want more Father’s Day recipes? Check these out! Hi Brandie, Sorry for your loss. May your memories of him comfort you this Father’s Day. I know how fresh it seems on holidays without the family your closest too. Thanks for sharing your recipe at the party. Pinned & shared. I love potato salad! I have never thought to put cheese in it. I am going to have to try this! 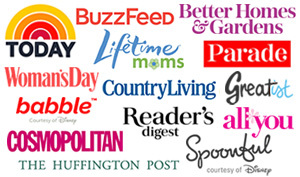 Thank you so much for linking up to Small Victories Sunday Linkup! Your recipe is featured on Full Plate Thursday this week. Hope you have a great 4th of July and enjoy your new Red Plate! Hi and congrats on the feature. This salad looks so good. I love that you shared your Dad’s favorites. He obviously has very good taste. You had me at cheddar and bacon. Thanks for sharing at Inspire Us Thursday. Your post brought tears to my eyes. It’s so hard losing our Dads. It’s lovely that you have a very happy memory of the last time you all got together, but it’s always hard missing them. My Dad has been gone five years now and I still miss him every day. I can definitely see why this recipe was one of your Dad’s favourites. It really is a lovely potato salad. Oh my this potato salad looks ah-mazing! I’m going to make it for our Canada Day long weekend! Major yum! Thank you so much, Jo-Anna! My dad would be proud to know someone in Canada was making my potato salad — he loved how blogs brought all of us from different countries together. 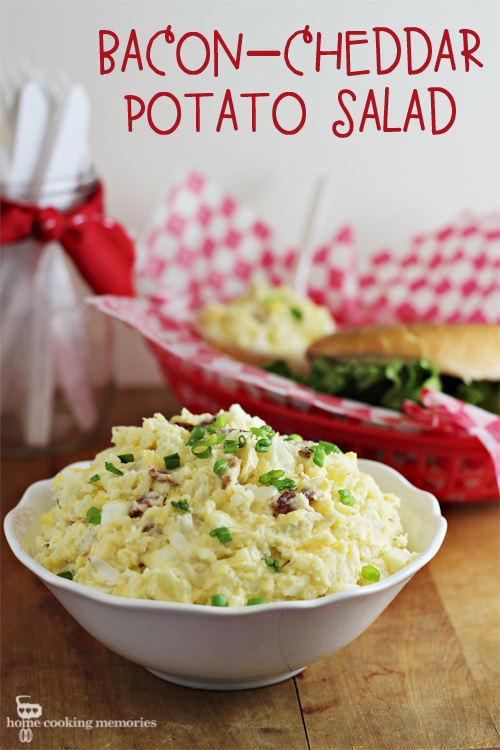 I just LOVE potato salad, but I am very picky about it – but this sounds really good! Thank so much! I’m kind of picky about the ones I eat too. I mean, I’ll try pretty much everything, but I have very clear favorites. I love all kinds of potato salad, this definitely goes on my keeper list! Such a beautiful tribute to your Dad! Thank you for sharing the story, as well as the recipe for your Dad’s favorite potato salad. Mmm – I have to agree with you – bacon, potato, and cheese is such a great combo…you can’t go wrong! This is a combination of all amazing things… potatoes, cheese and bacon. This is a fantastic potato salad. Also, a wonderful tribute to your father! Such a lovely post and so sad to hear that its your 2nd Father’s Day without him.But I’m sure he’s happy you made his favorite dish 🙂 I love the bacon in there!Yumm!! Oh my! This would be dangerous to have in my house. I’m always looking for the perfect potato salad recipe and yours seems like a winner! This was my 3rd father’s day without my dad. What a fitting way to honor your dad. 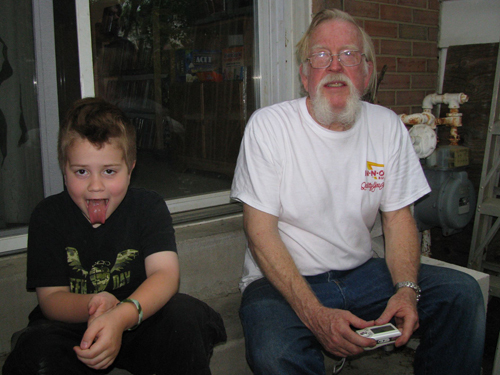 I’m sorry you are missing your dad but I love the photo of your son and your dad. Great memories. This potato salad sounds delicious! What a lovely post and I am so sorry you don’t have your father with you anymore. I know that feeling as is has now been many years since my dad has passed. Your potato salad looks amazing!! It’s also my 2nd Father’s day without my dad. What a great tribute you have for him and to show how each moment you spend with a dad or loved one should be cherished. This is a wonderful post in honor of your Father. I can tell you it gets a little easier as time goes on. Cherish his memory and celebrate his life today. Moving onto that potato salad – holy moly. I think we may have to make it for our BBQ today! I’ve never been big into pasta salads, but if you add bacon and cheddar, I’m in! What a great potato salad! I bet it tastes amazing!!!!!!! I am happy that your last few memories of your father were so happy.